WASHINGTON — The weekend will be cold and dry, before we watch for a hazard of wintry continue rise Sunday night that will impact a Monday morning commute. Winter Weather Advisories have now been combined for Charles county, by Fredericksburg and partial of a northern neck until Monday morning during 7 AM. 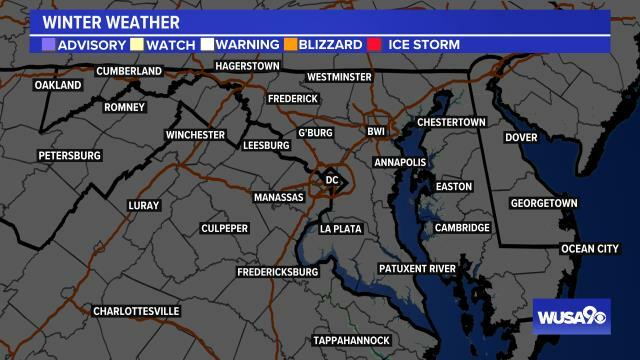 The winter continue advisory will run until 10 AM for a DC metro and points northwest. This will be extended longer for areas distant north, where temps will float nearby a frozen symbol with a wintry brew durability many longer. The wintry brew moves in this dusk after 7 PM for most. Some roads will be sharp for a Monday morning invert as we lane snow, sleet, and frozen sleet for tools of a area. Highest hazard for icy roads is north and northwest of DC. Sunday Night: Snow, sleet. frozen sleet with sleet south. Coating to 1″ D.C. and points north. Low: 32. Monday: Mix north and northwest, a cold sleet DC and points south. High: 36. Monday Night: Snow, sleet. frozen sleet good north and northwest with sleet DC metro and south. Low: 33. Tuesday: Mix good north to rain, a cold sleet elsewhere. High: 40. After Tuesday, a continue dries out Wednesday and Thursday as highs stand into a 40s and low 50s. Another charge complement will move us sleet Friday afternoon into Saturday morning, and that sleet could be locally heavy. Read some-more about a winter continue chances here. Monday: Cloudy and cold with a brew probable (especially north northwest), sleet south and east. Highs: 32 – 38. Winds: NE 5 – 10. Tuesday: Cloudy and cold with a brew probable early north of DC, branch to sleet by a afternoon. All sleet south and east. Highs: 38 – 43. Winds: NE to E -10. Wednesday: Partly sunny, spacious and milder. Highs: Mid 40s. Wednesday: Morning sun, augmenting afternoon clouds. Highs: Low 50s.